For more information or to order, email contactme@shelleyhancock.com. 1) Far-Infrared Rays (FIR) is healing energy from the sun without the harmful radiation. 2) Acupuncture without needles to stimulate meridian channels to increase blood circulation, lymphatic drainage and chi energy flow. 3) Negative Ions are the cleansing molecules of nature. 4) Heat Therapy (Moxibustion) without smell or smoke, traditional Asian health principle using localized heat therapy to relax our autonomic nerve system. Tourmaline gemstone is a semi-precious mineral stone well known for its incredible ability to aid in the detoxification process of the human body. It is one of only a handful of minerals that have the ability to emit negative ions and far- infrared rays. Furthermore, tourmaline produces a detoxifying, cleansing effect on the nervous system, as well as the organs and tissues of the body. It has been shown as a useful aid for improving circulation, reducing stress, improving brain alertness, mood and activating the immune system. What is the LING Energy Lift Tourmaline Wellness Therapy? LING has harnessed the powers of the Tourmaline gemstone! 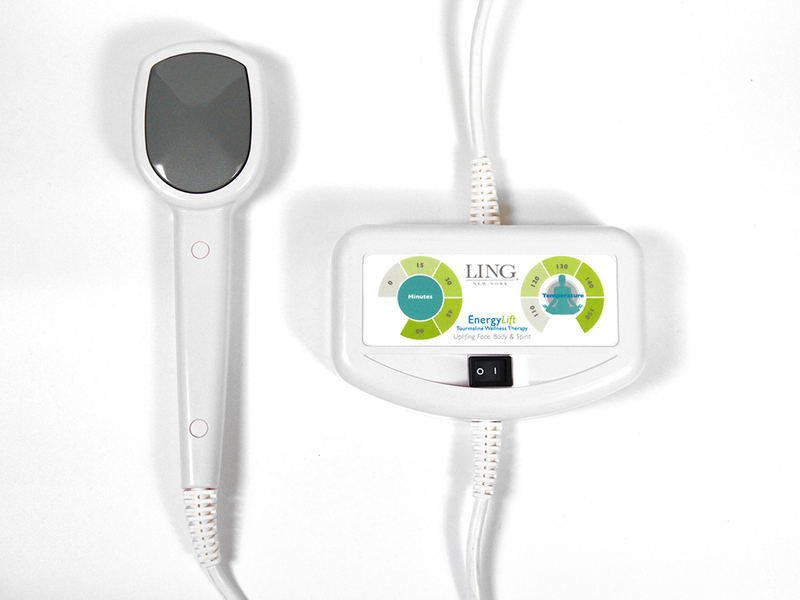 The LING Energy Lift system uses proprietary technology to energize the precious gemstone. When the Tourmaline gemstone is energized it emits powerful and healthy negative ions and far-infrared rays. Tourmaline is only one of a handful of stones with that ability. By applying this wonderful healing energy to the body and face at special acupoints, we unlock the full potential benefits. You will experience a one of a kind treatment that will uplift your face, body and spirit. Far-Infrared Rays are invisible rays of energy vibration that have the unique ability to penetrate all layers of the human physical body, reaching the tissues and muscles. Far infrared ray energy is the same frequency as our body’s natural energy or ‘chi’, thus proper cellular function is activated. FIR is neither heat nor hot rays, but warm vibration from solar energy. Conventional heat warms the air and only the surface of skin. However, FIR penetrates deep into our bodies and vibrates our water molecules, creating heat within. Ever wonder why it feels so good to be exposed to sunshine? That is because living things require sunlight to grow and thrive. 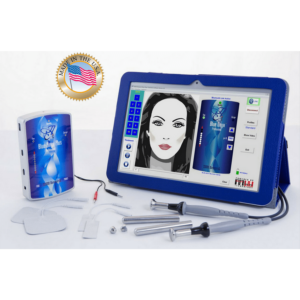 Far infrared light, is the safest segment of energy that comes from the sun, offering a wide array of therapeutic benefits for the face, body and overall sense of well-being. Fact: In the 1960s, NASA research revealed that all living beings on Earth receive solar energy vibrations to sustain life. NASA confirmed that this range of vibration (8-14 microns) exists within the infrared spectrum (0.76 to 1,000 microns vibration), which is invisible to the human eye. This narrow range of FIR vibration is the only solar energy that promotes life. When the body receives FIR, our cells are activated because they are of the same frequency. October 2018: I was introduced to LING products almost a year ago and fell in LOVE with them. I have back bar sizes of the products in my bathroom! About 4 months ago they sent me their LING Energy Lift piece of equipment. I started using it on myself and my first thought was “Wow, this feels really great”. It’s FAR (far infrared) heat and tourmaline crystal. I can’t say that I saw a huge difference after the first treatment I gave myself but I felt really good…..peaceful. I continued to give myself treatments and I continued to feel peaceful afterwards and I also started noticing that I was sleeping better. I have never slept better after having a facial treatment. I started noticing some changes after about the 4th treatment. Better hydration and some toning on my jawline. The eyebrows definitely looked raised. It wasn’t the WOW factor I was looking for though so I stopped for about a week. But I couldn’t stop thinking about it!! I have never experienced this when I’m testing a new piece of equipment. I typically know right away whether I like it or not. Part of this is instinctual and part of it is what I see when I finish working on myself. But I have never not been wowed but not been able to get my mind off of the equipment. This was something new! One day when I was chatting with Ling’s son, Patrick, I told him that I was so “drawn” to the Energy Lift. He laughed and said that’s the tourmaline crystal!! 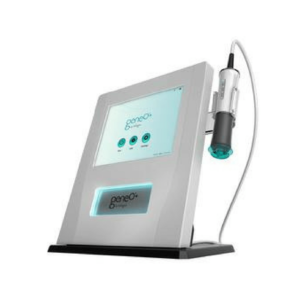 There is so much more to this than just what you see when you finish a treatment. It’s actually detoxing your body and a feeling of euphoria comes over you. At the LING Spas in New York they start the treatment using the Energy Lift up and down the back for 10 minutes. It took me four months to bring this equipment to you because I didn’t really know what I was feeling and how to explain it. I have done the treatment on several clients and their reaction is the same. They LOVE the way it makes them feel and we know that when we make them feel good, they coming back for more! If $3500 (includes LING products) is in the budget, I highly recommend this equipment! 2. Add on treatment to any existing facial or massage, no need to change spa menu!